Pictures 26-33 were taken on December 28, 2007. The audio was taken on November 11, 2007. Pictures 34-35 were taken on April 11, 2008. Pictures 36-54 were taken on May 26, 2008. Pictures 64-117 and the video were taken on January 26, 2016. Pictures 118-124 were taken on February 7, 2018. Pictures 55-63 were taken on A.J. Gonfiantini. Pictures 34-54 and 64-124 and the video and audio were taken by Tommy McGowan. 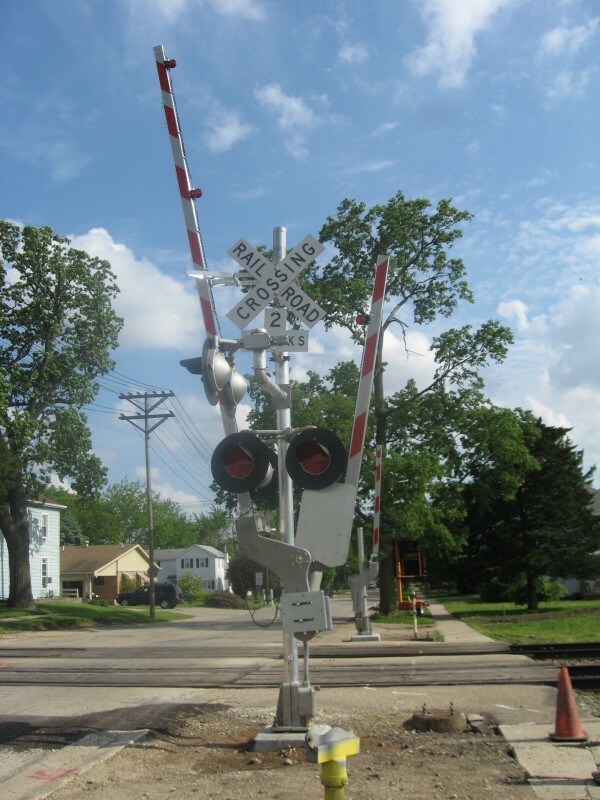 This crossing is located on the BNSF Aurora Sub. An interesting sign. 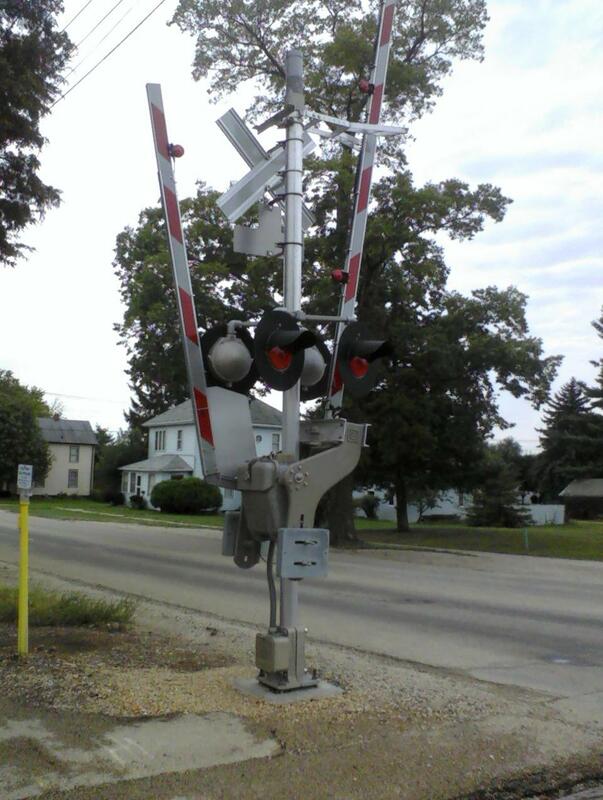 Both signals have 12"x20" old WCH lights, and one mechanical bell that's on top of the signal in picture 2. Closeups including the WCH name. Note a small patch over the lights in picture 4. There used to be sidelights. The wooden grade is in good shape. Just to show you how big the gap between the end of the board and the track was. 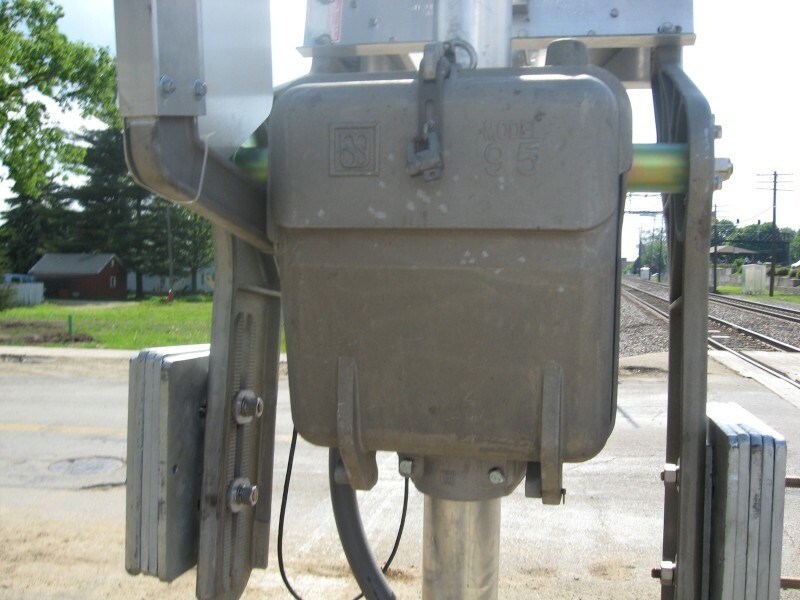 The other signal with the bell. Another view of the wooden grade. A very low look at the tracks facing East. 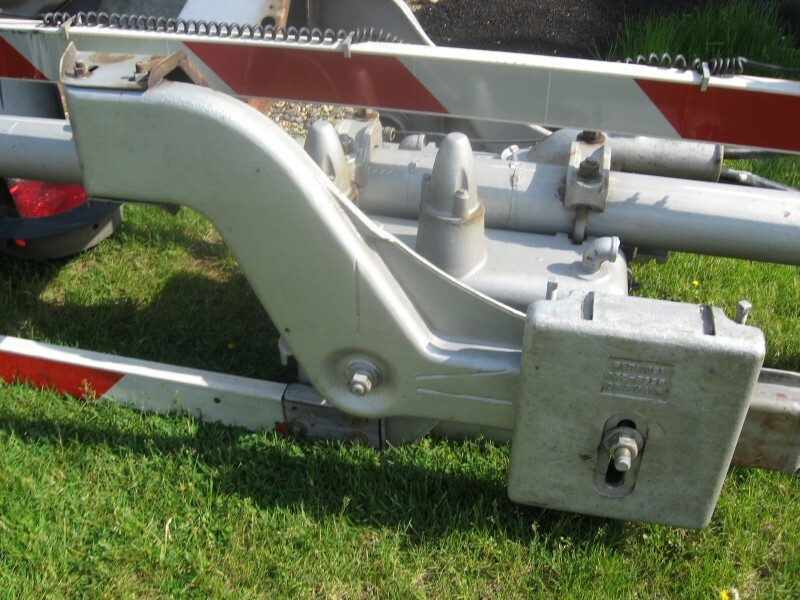 An old WRRS gate motor. Looking east at a private road. The bell belongs to WCH. 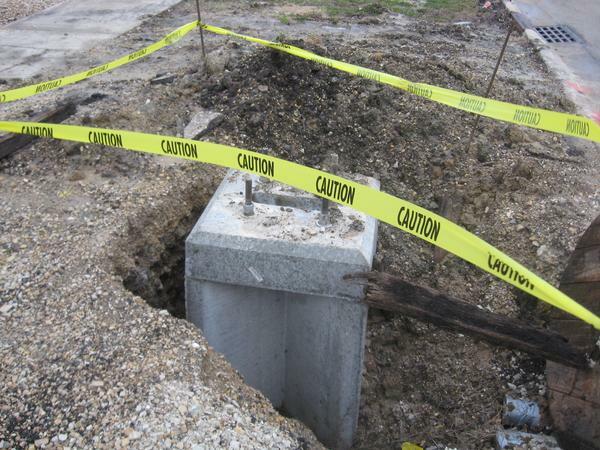 Another look at one of the pedestrian gates. Looking West from the private road. An overview of the crossing. You can also see the UP crossing in the distance. The crossbuck is put on the wrong way! 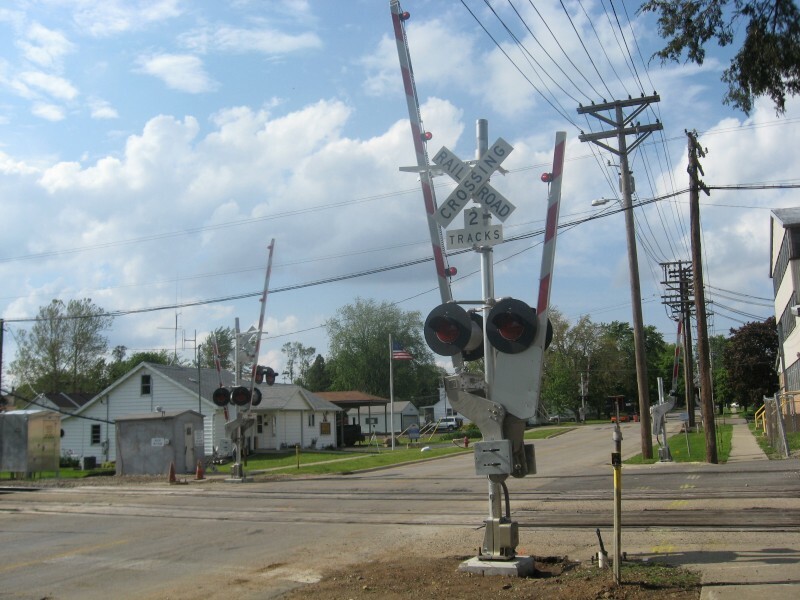 The UP crossing is in action in the background. The lights are flashing, but it's hard to see, since the pictures were taken so close. Believe it or not, picture 26 was taken from a cell phone! 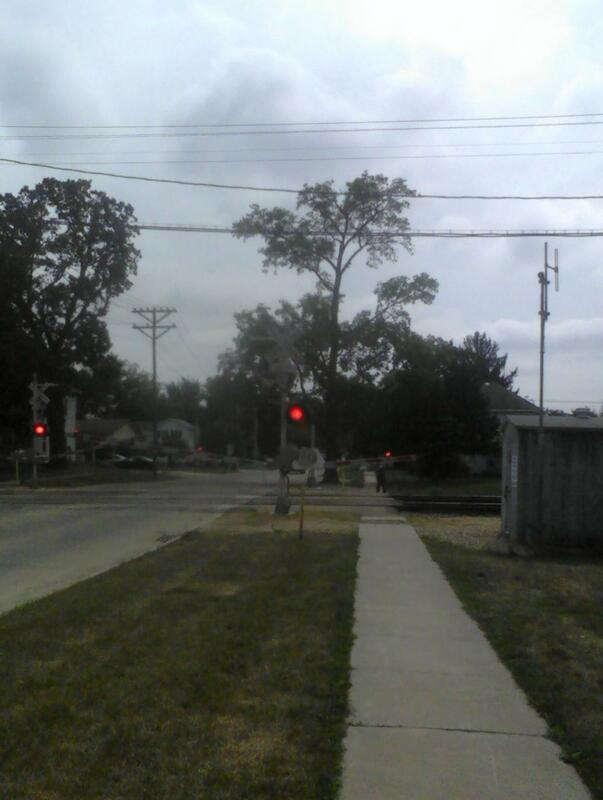 A weird story exists for picture 27: A BNSF stack train had full clearence and all greens to Flag Center. Another horn sounded and was thought to be another train. It was only an echo. 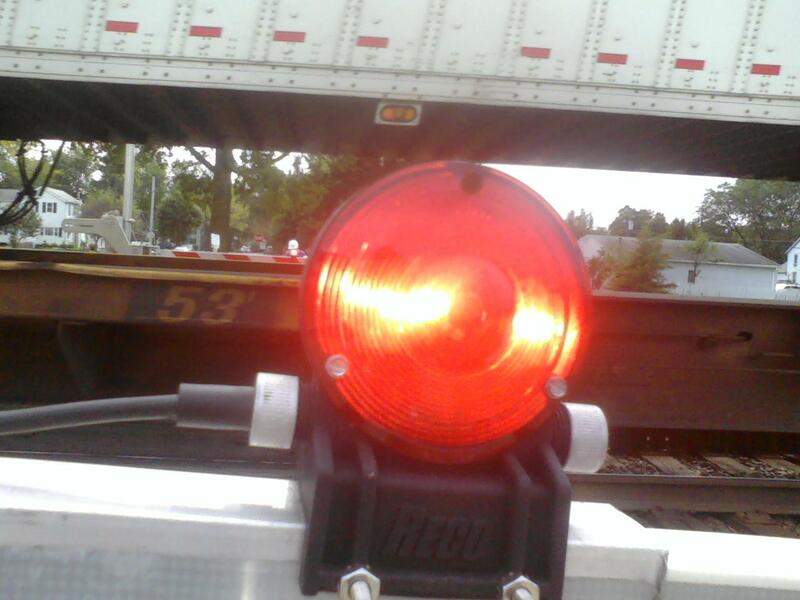 Looking back, the signal changes from green to red! The train is then put into Emergency. As soon as the train passed, it changed back to a green, but the engineers were to close to see that. The train was in emergency for a good 10 minutes. 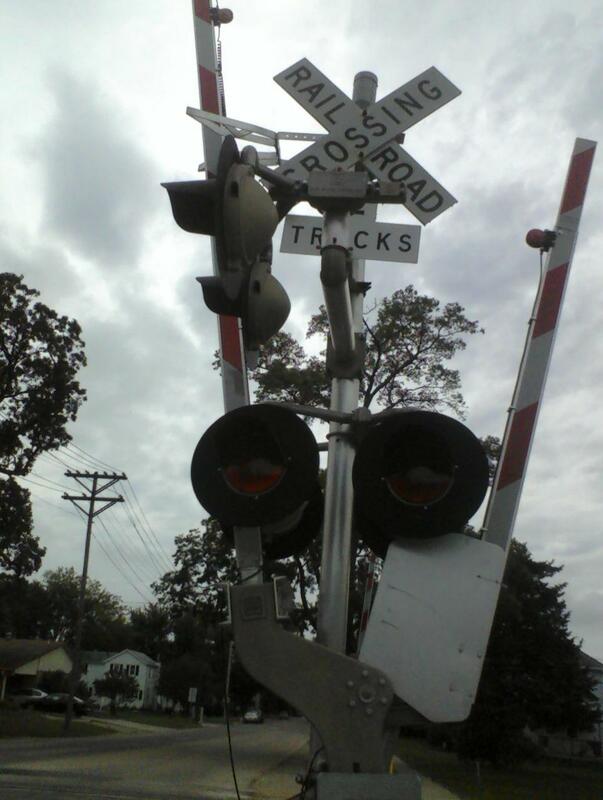 It didn't stop over the diamond, but because it was stopped past the signal, the UP mainfest could not pass. 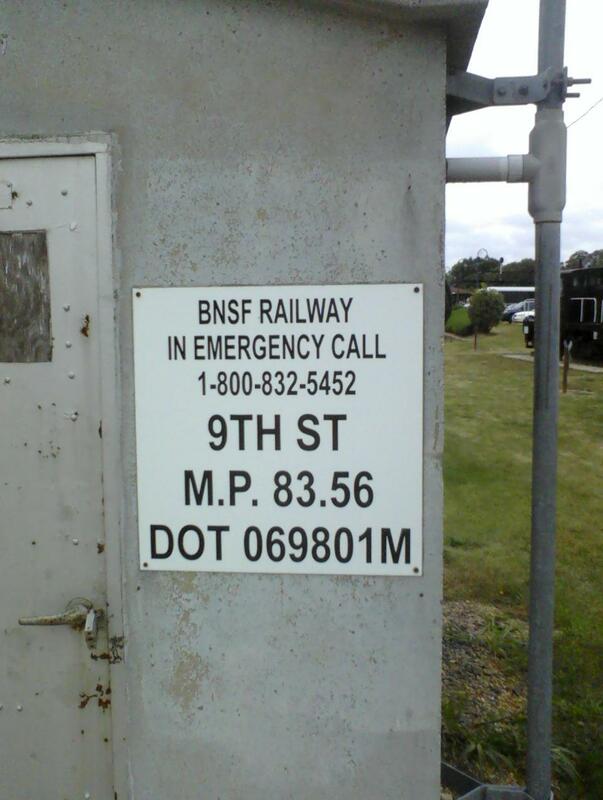 BNSF crews thought the crews had gone loco, since BNSF didn't really believe them! A snowy view of one of the gates. 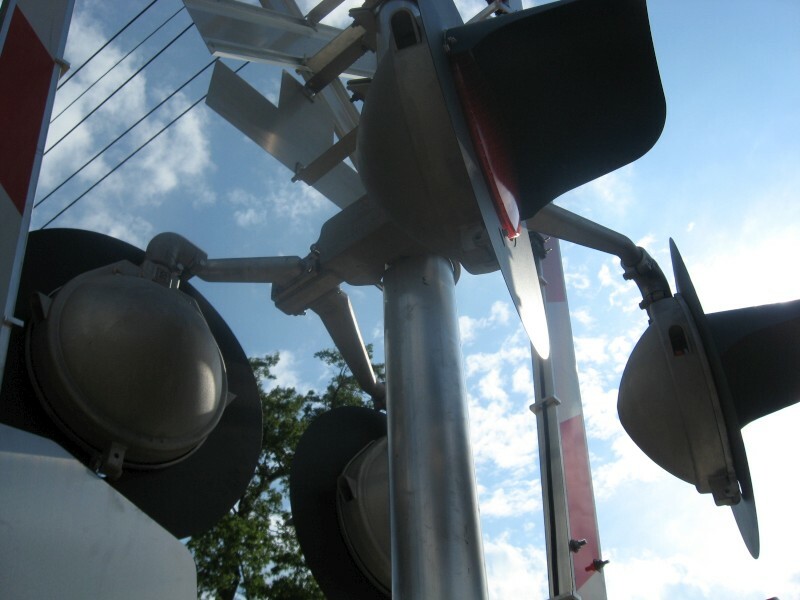 A view of the other signal in action. 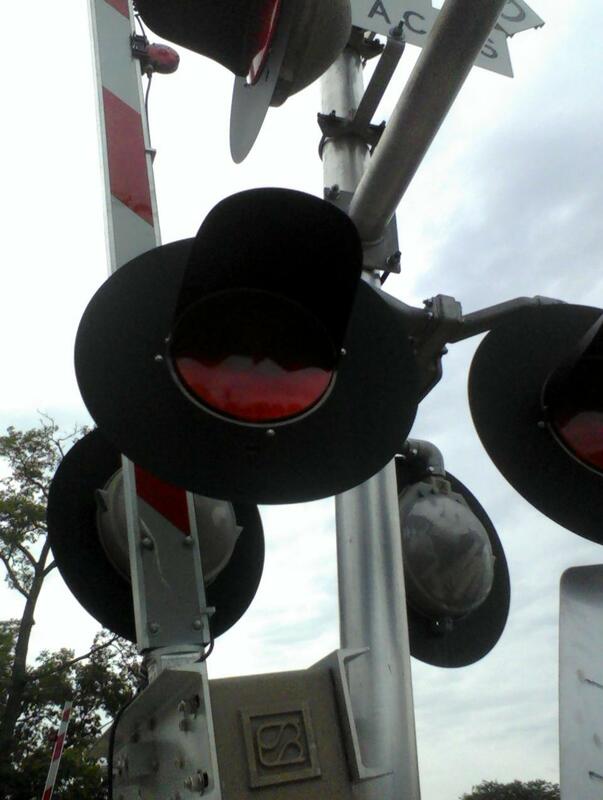 Click below to hear an audio of the old signals. 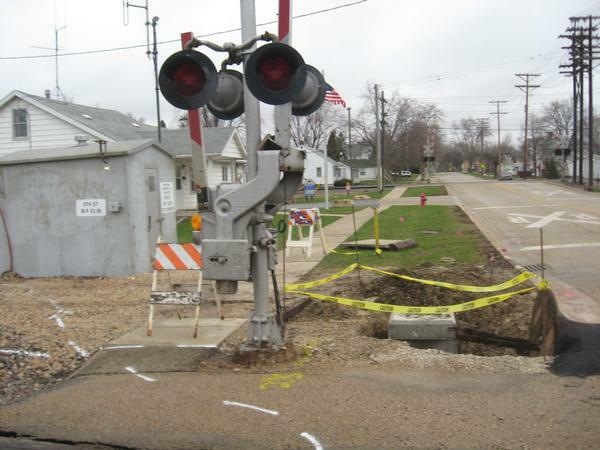 In April 2008, we see the crossing is about to get a major upgrade. 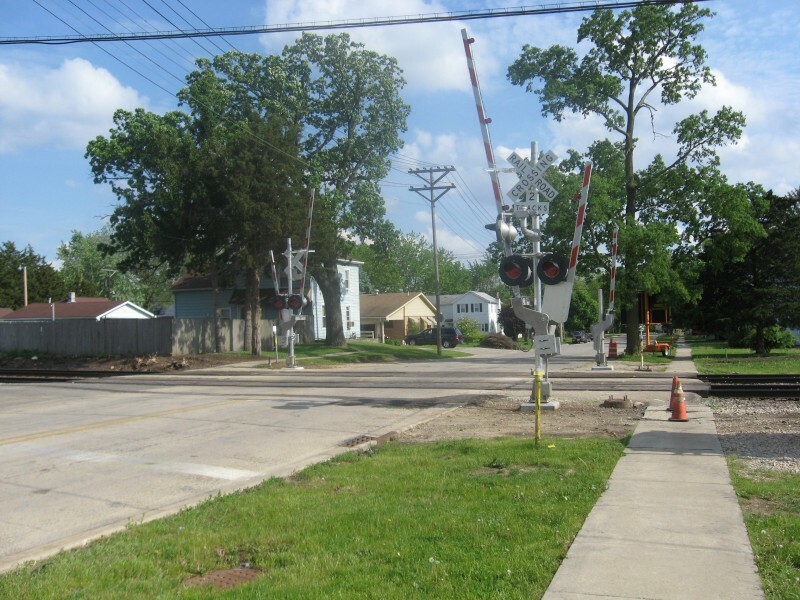 Between May 17 and May 23, 2008, new signals and pedestrian gates were installed and the old signals were removed. Facing south at new signals. 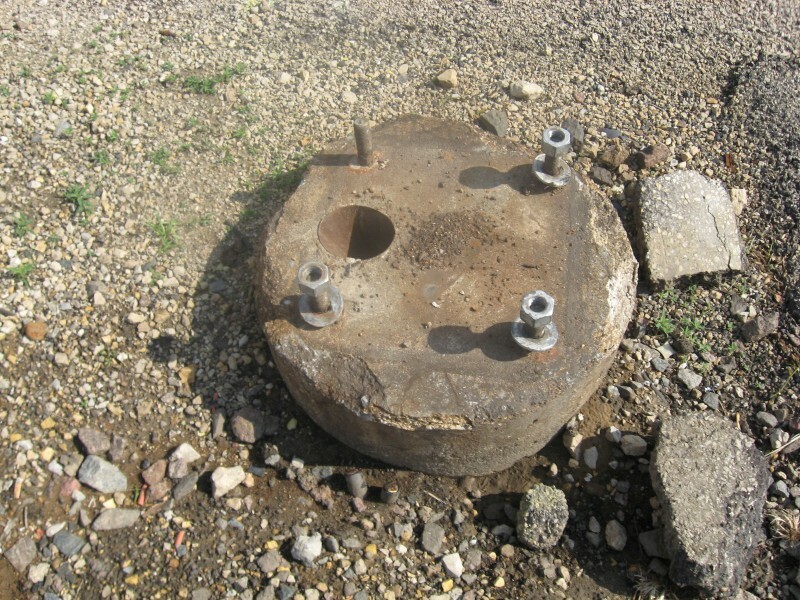 The old base had yet to be removed. US&S 12"x24" frames with Dialight ball LEDs. 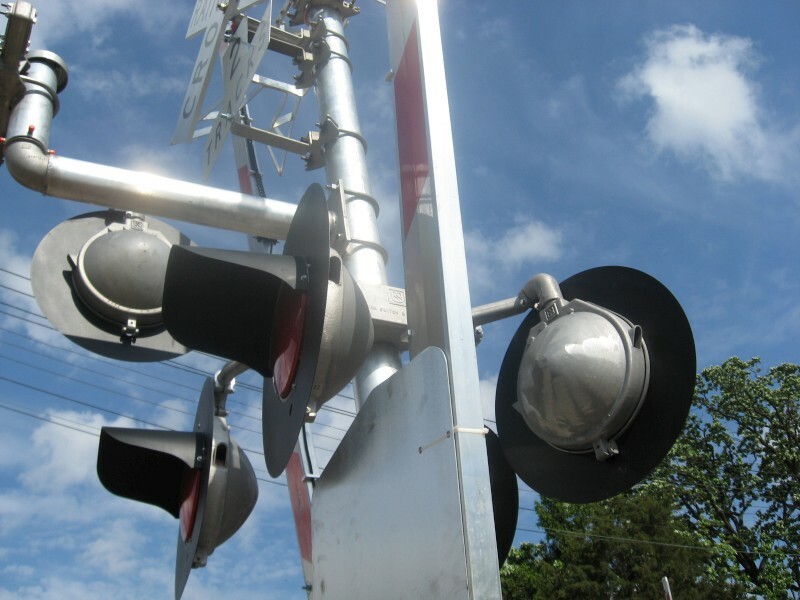 Both signals have a Safetran type 3 e-bell. 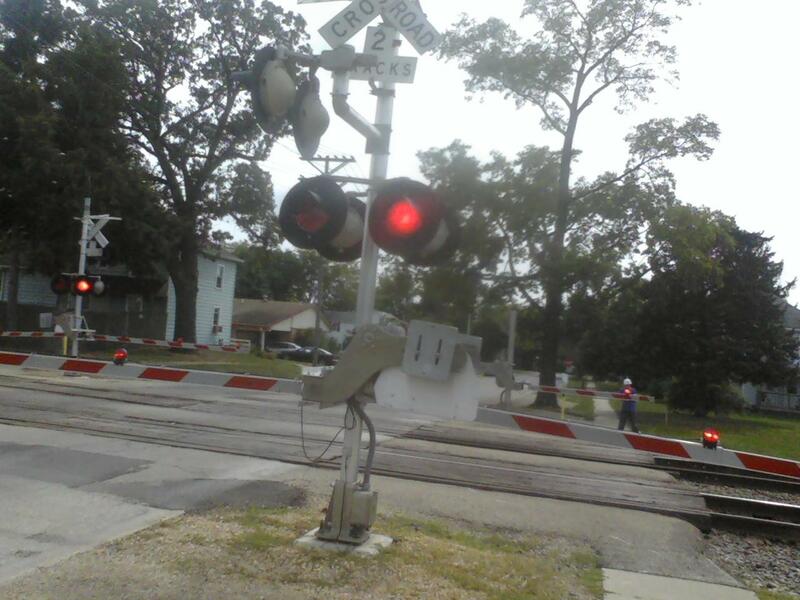 BNSF has installed these new signals on nearly every crossing on BNSF in Rochelle. Note new sidelights for the private road. US&S signal and my shadow. 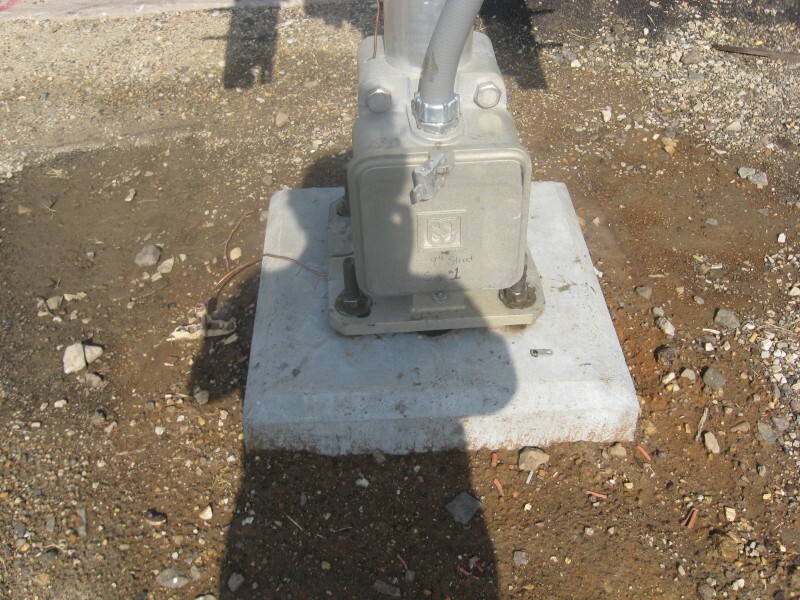 The old northern signal base. Even the rare ped gates were forced to say good bye. But don't count your tears yet. 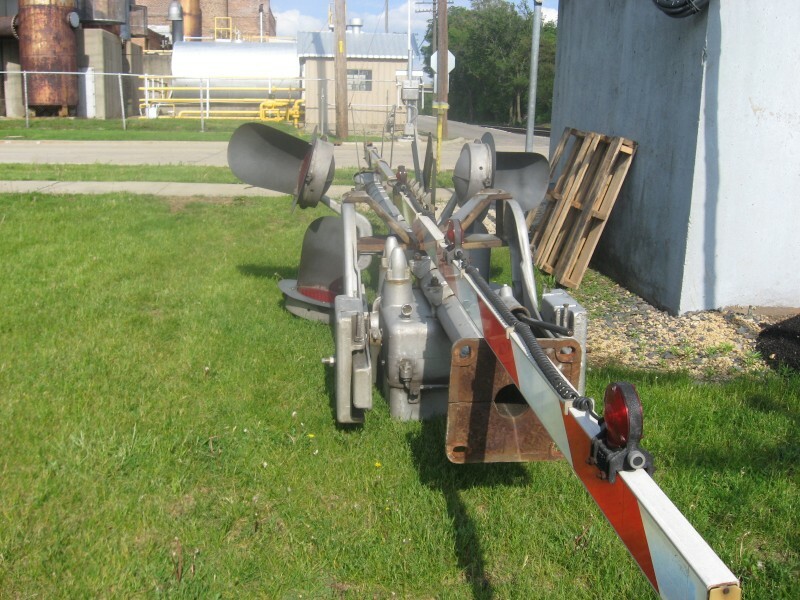 The old northern signal lays on its side here as BNSF donated it to the park! 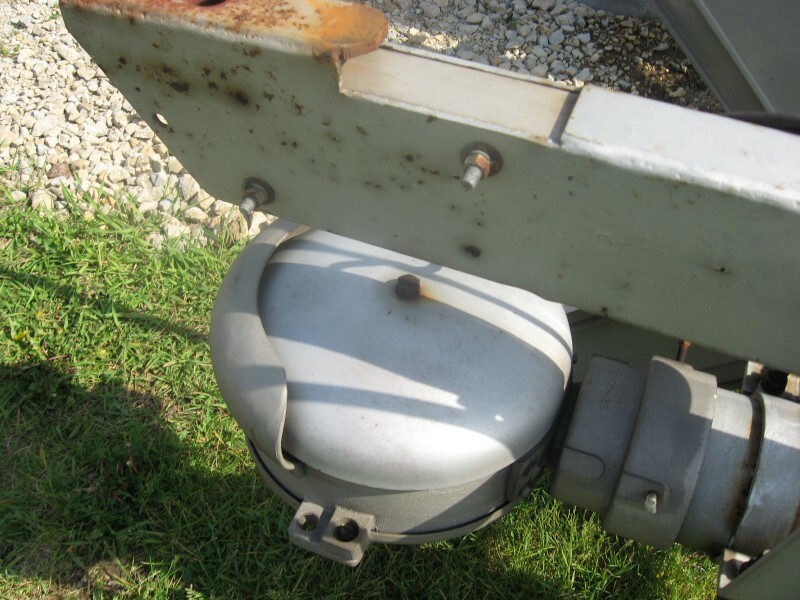 The old WCH 12"x20" lights. 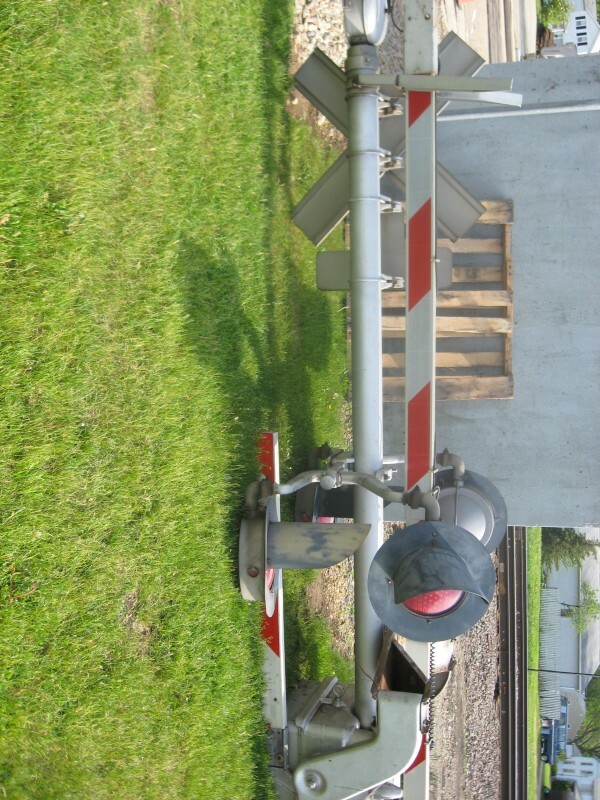 Another view of the old signal. 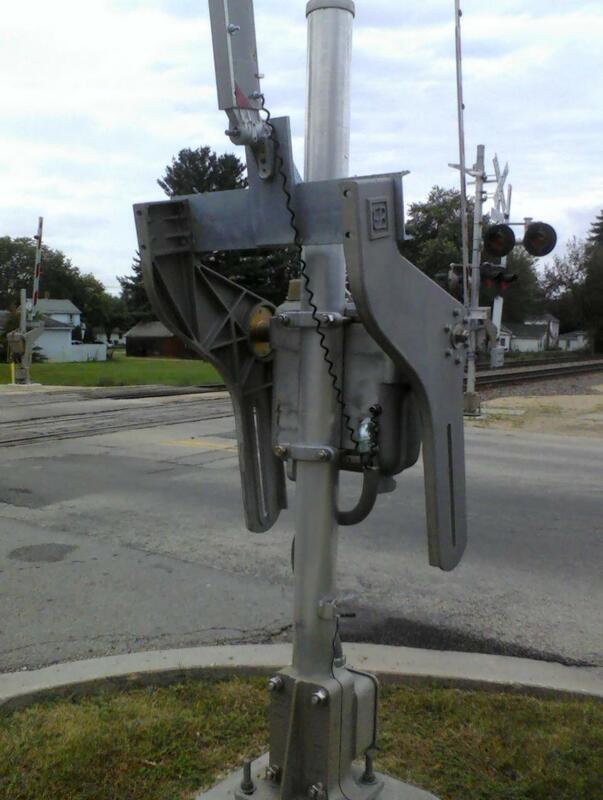 By early June, the old signal bases were removed and the old signal was erected in the railfan park. Besides that, nothing else changed between 2008 and 2010. On September 18, 2010, A.J. Gonfiantini came out to the crossing, showing no changes to the signals. 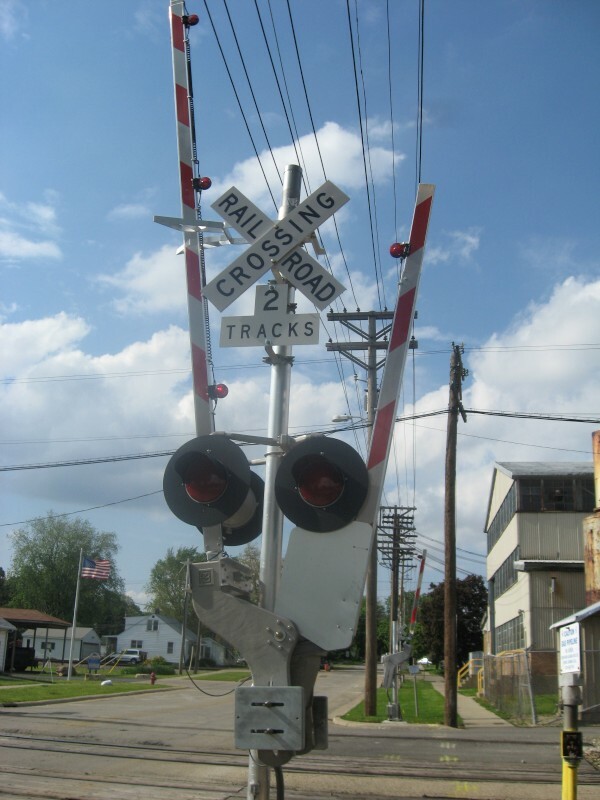 Between 2010 and 2016, blue DOT signs were added, and the crossbucks and track signs were replaced. 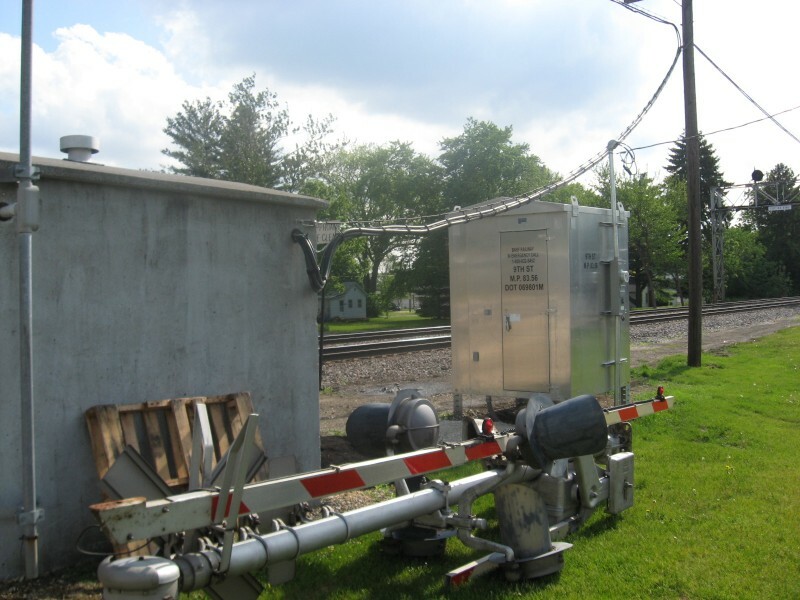 Also at some point, the US&S base on the northern signal was replaced with a Safetran base. The relay bungalows in the northwest quadrant. Yes, the old bungalow had still not been removed by 2016. The grade is now all concrete. Track view facing west towards Route 38. Note the replacement for the searchlights. Track view facing east towards Pedestrian Crossing #1. 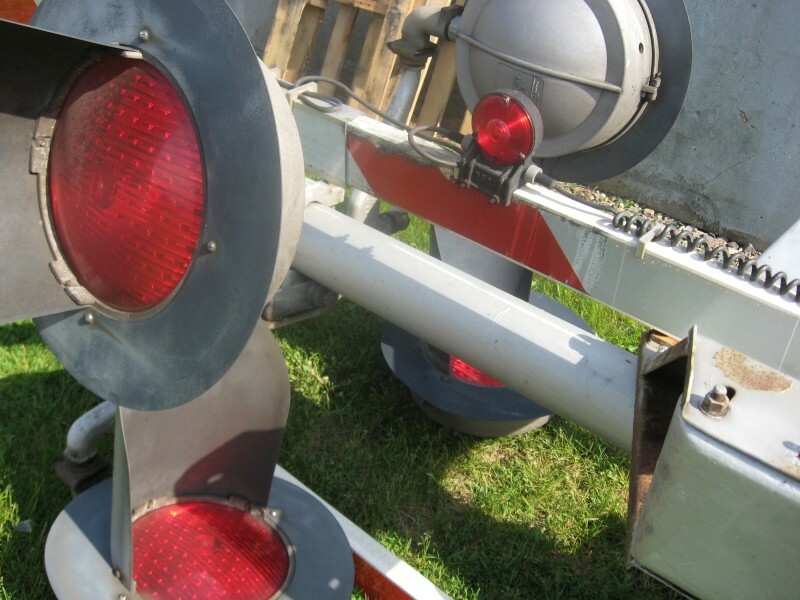 Here's the old northern signal from the crossing which is now a display for the railfan park. 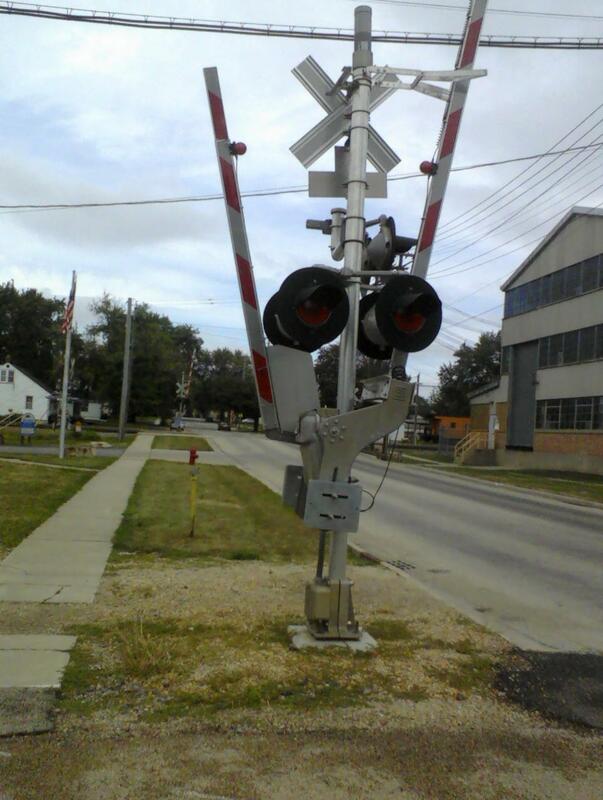 I'm glad to see this is preserved since this one of the first signals I ever saw in action back in 1999. 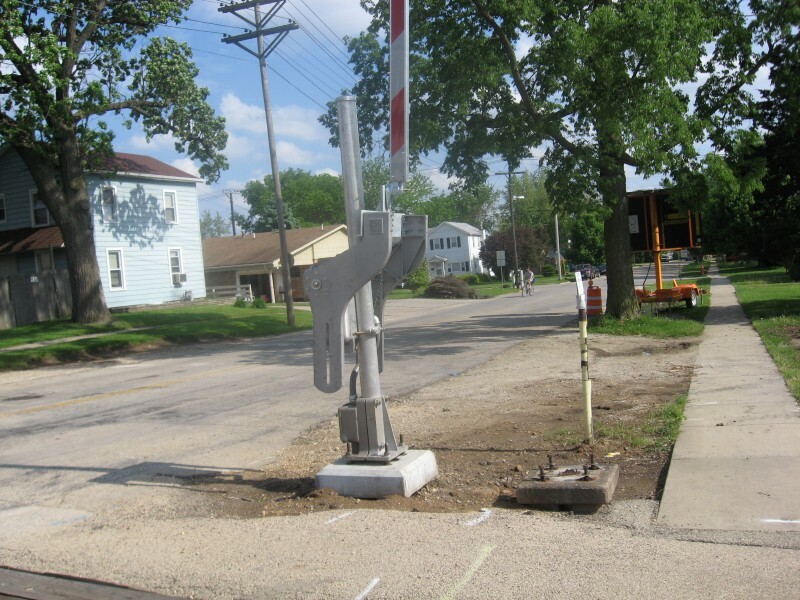 In early 2016, the road was repaved and a median was added in preparation for Rochelle to become a quiet zone. 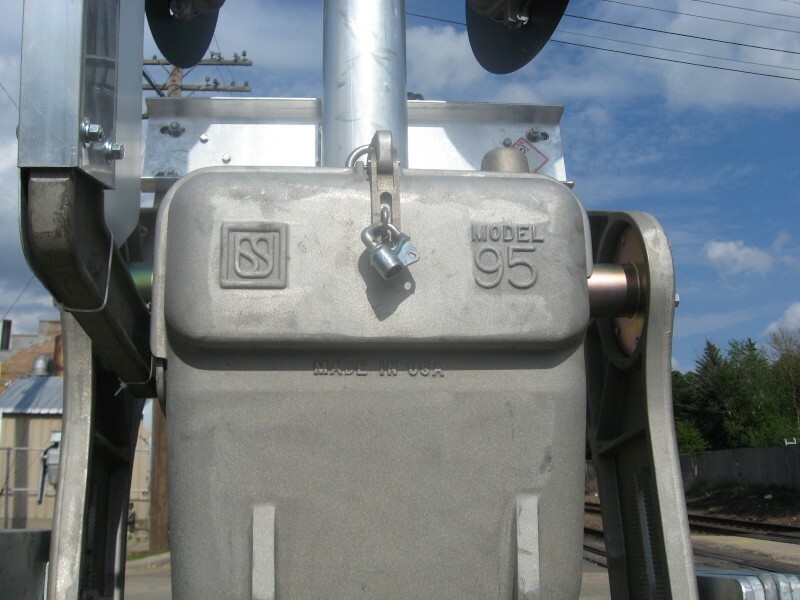 On June 29, 2016, all 4 of the searchlight signal bridges were decomissioned and removed. The BNSF ones were all scrapped while part of the UP ones were saved and put on display in the park. By spring 2017, the old relay bungalow was finally removed. 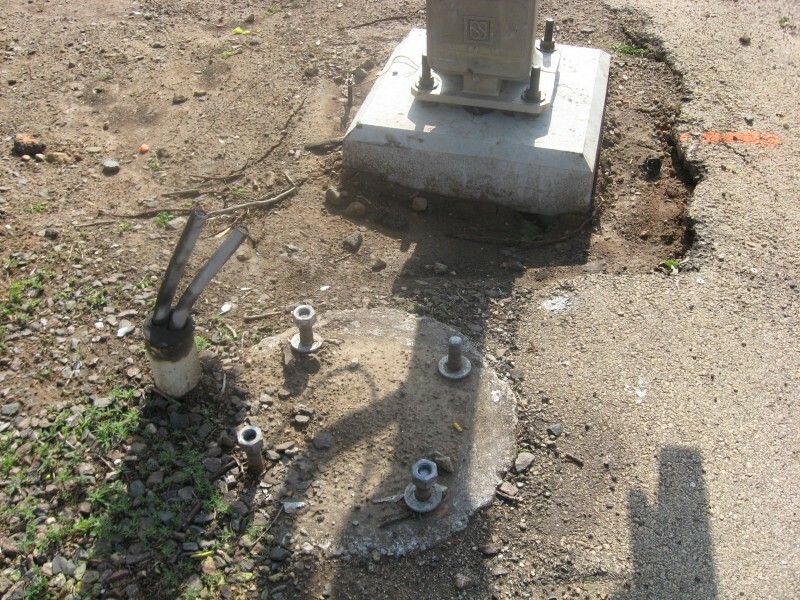 Around the same time, the private road leading up the crossing was closed and the sidewalk on the east side was repaved. Views of the updates. The wire for the old bungalow is wrapped around the telegraph pole. 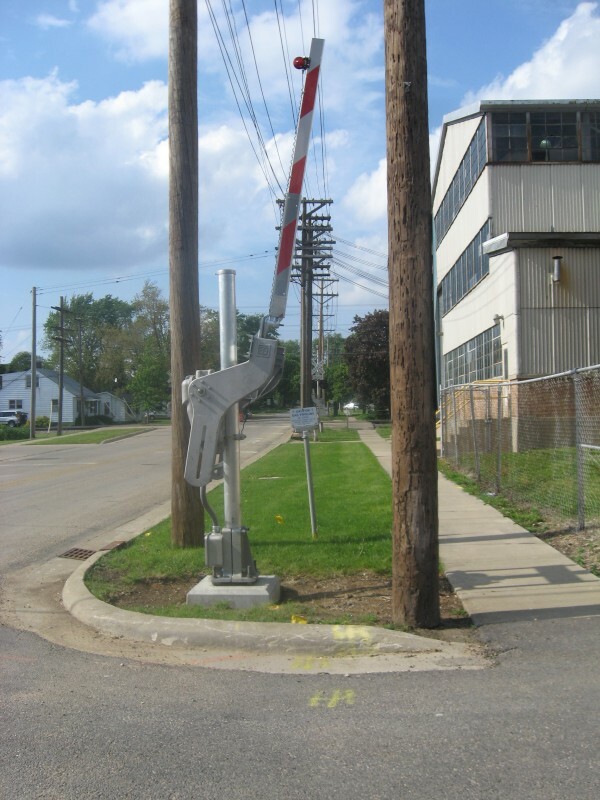 The old pole line is still standing as of early 2019.